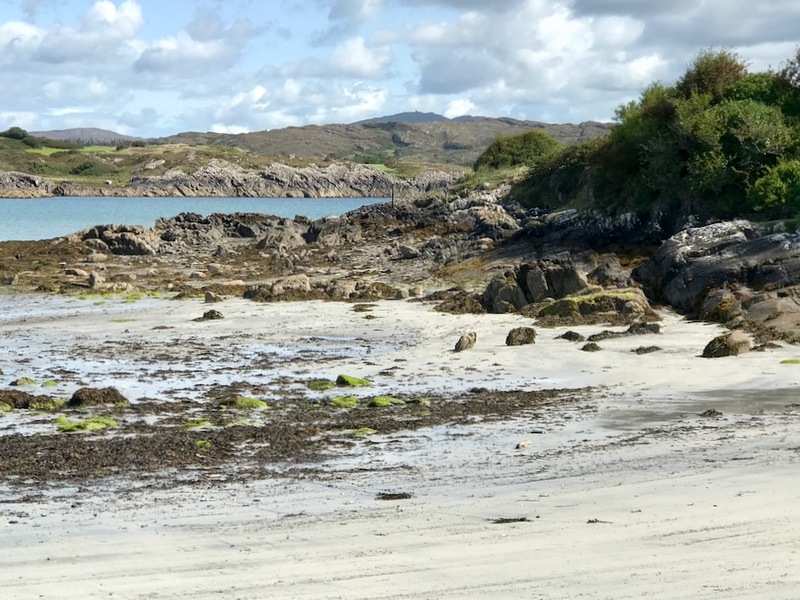 Last week, Finola wrote about the discovery of what is probably an intertidal fulacht fia on the beach at Ballyrisode, not too far west of us down the Mizen Peninsula. 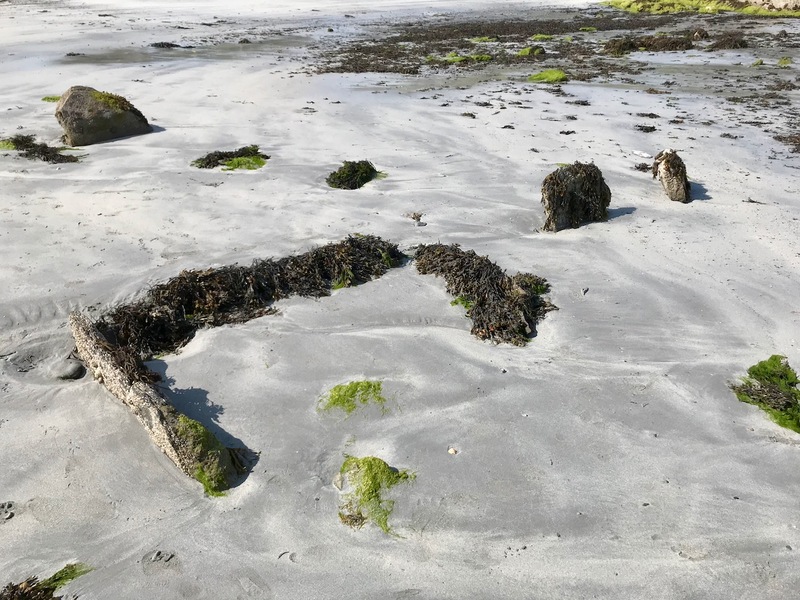 Following the publication of her post, we received a host of comments and messages, including from our friend Dr Connie Kelleher – an underwater archaeologist and well-known specialist on the history of piracy in West Cork. Connie told us that she and a colleague – Áine Brosnan – had examined the site back in 2012 because they were looking for links to pirate connections! The mention of pirates took me back to my 2016 post – Canty – click here now and have a read, then return to this page for more insights. 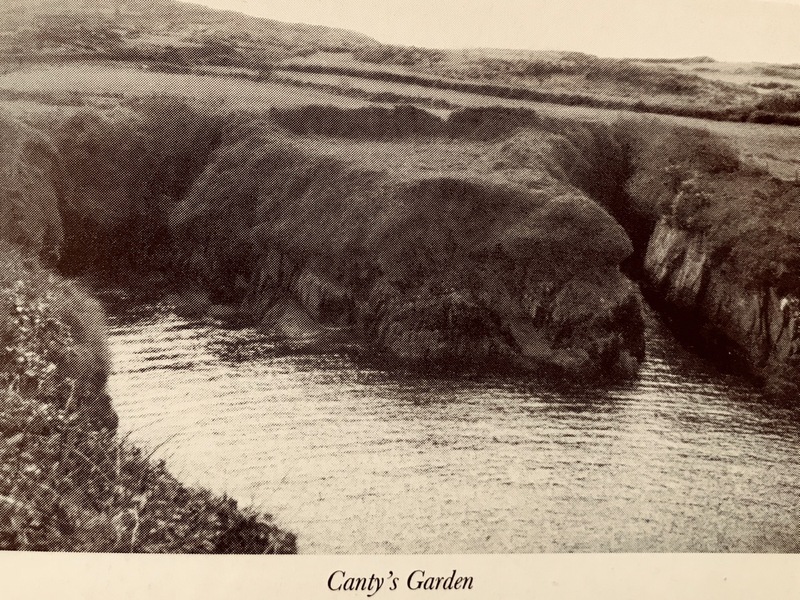 One of my resources when researching for Canty was an article by John Hawke in Volume 5 of the Mizen Journal, published in 1997: Canty’s Cove – Legend and History. I only used snippets in my post then, as I concentrated on Canty’s lair on the Northside. Today I’ll expand on Canty’s exploits to the south and west, including his connections with Ballyrisode. Connie made a very valuable point in her comments to us that Canty was a Gaelic-Irish pirate on the opposite side of the peninsula to William Hull and active at a time when the English pirates were headquartered in Leamcon, Baltimore and Crookhaven; he appears to have remained in control within his own domain to at least 1629 but most probably into the 1640s.
. . . 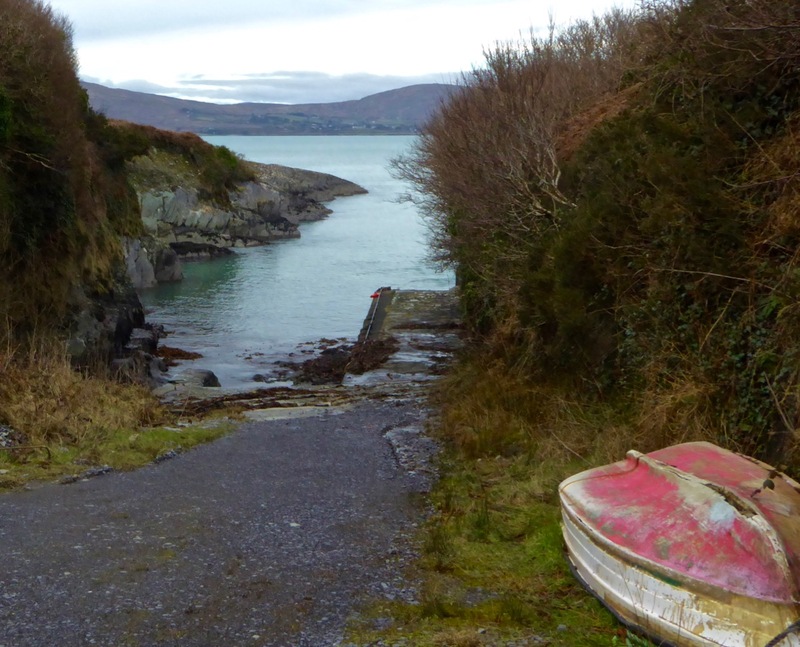 Boats from America and elsewhere came into Dunmanus Bay, the captains were invited into his house by Canty, were dazzled by a special grog, robbed and pushed through the north door over the cliff into the cove to the north. On one occasion Canty wanted to stop an invasion by some outsiders at Ballyrisode. He had a daughter, who did not want him to go and tried to stop him, so he shot her. He then crossed by land to Ballyrisode and by moonlight fought a battle on the first strand, which he won. Gravestones to the dead stood on the shore. One day, the son of a captain previously murdered by Canty, who was also a captain, on returning from America was invited in by Canty. But, knowing more than his father, when Canty asked him to step outside he pushed Canty over the cliff . . . James himself remembers some gravestones, but these have been covered by encroaching sand over recent years . . . Graves existing on the second strand are of drowned sailors . . . This very categoric piece of information suggests that James Camier (or perhaps his father) attribute the stones on the ‘second strand’ to sailors’ graves. 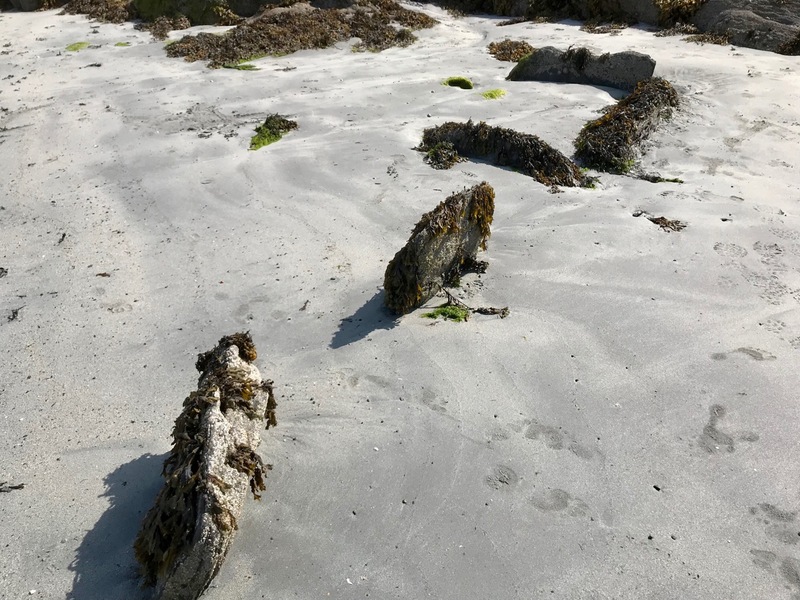 These stones are probably the small upright stones which lie close to the fulacht fia today: they certainly resemble grave markers in size and shape. In the context of a Bronze Age fulacht fia such stones were probably part of a hearth or roasting-pit. It is illegal to disturb any archaeological site (please note!). Our activities at Ballysrisode were confined to measuring and photography. However, we made a series of probes across the beach to test the depth of the sand (and imagine how many excavations have been made on that beach over the years by eager sandcastle engineers!). Our results show that there seems to be a consistent depth of only 50mm to 200mm over the main beach. Hmmmm… not enough to bury any pirate bones methinks. Also, it’s rather unlikely that any pirates would stay around to firmly fix substantial stone markers over the graves of their dead comrades (or enemies). But I would never want to stand in the way of a good tale.
. . . Canty’s Cove was always seen in the locality as a lonesome place at night and there are various stories of unexplained sightings – old longboats coming in and out, a man walking along the ledge on the far side of the Cove from the pier and suddenly disappearing, and of “white” hands helping the captain to tie up his seine boat . . .
I’m not sure that I’d be up for a visit to Canty’s Cove after sunset (above), but the beautiful white strands at Ballyrisode would be most attractive in the moonlight, and – who knows – it might be a good time to see if there is any ghostly pirate activity in this historically significant place. 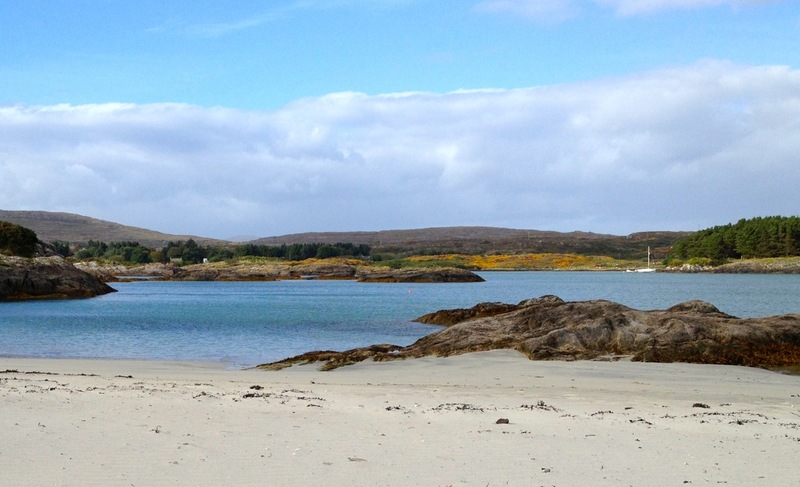 ‘Will the Hare’ – and the Mizen Olympics! 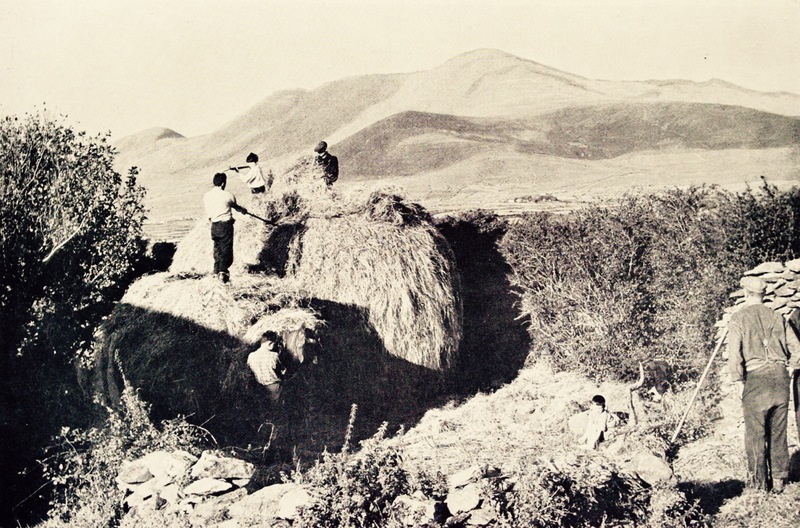 Today we celebrate Lúnasa – the festival of the bringing-in of the harvest. 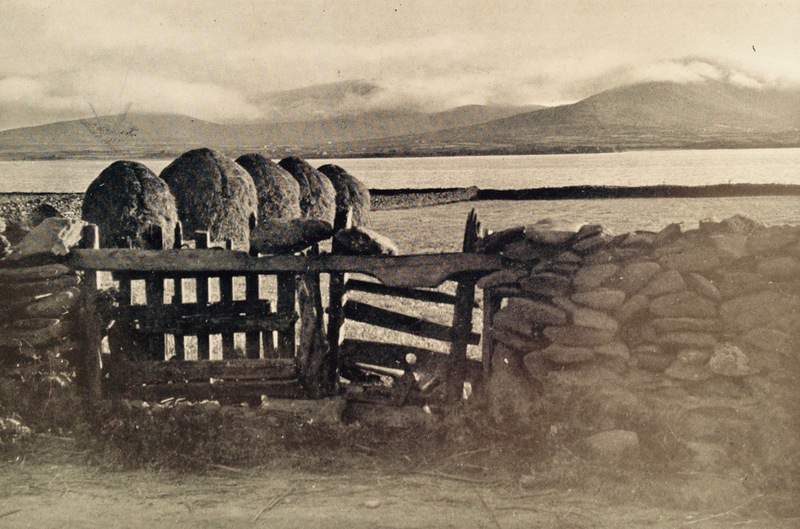 Kevin Danaher (The Year in Ireland, Mercier Press 1972) wrote (above) about what he observed in the middle of the last century, when things were already changing and many of the old customs were, as he notes, ‘in the main forgotten’, although still talked about. 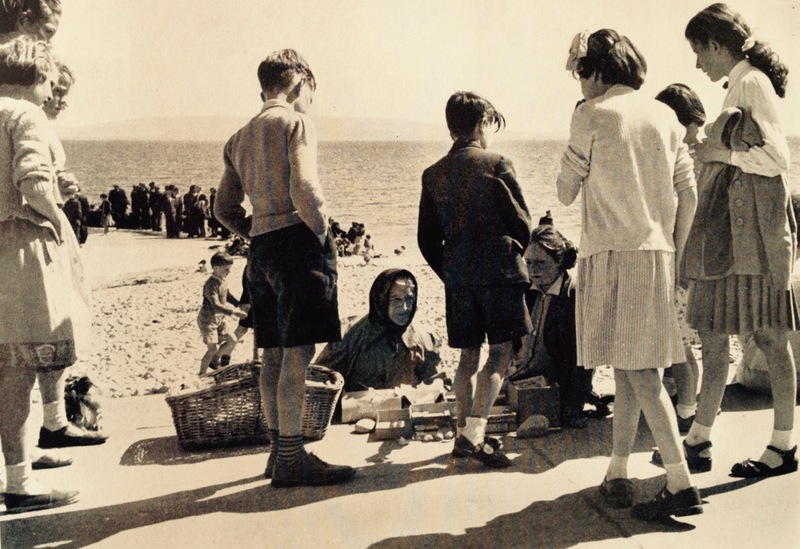 What changes do we see in Ireland, a few generations on? 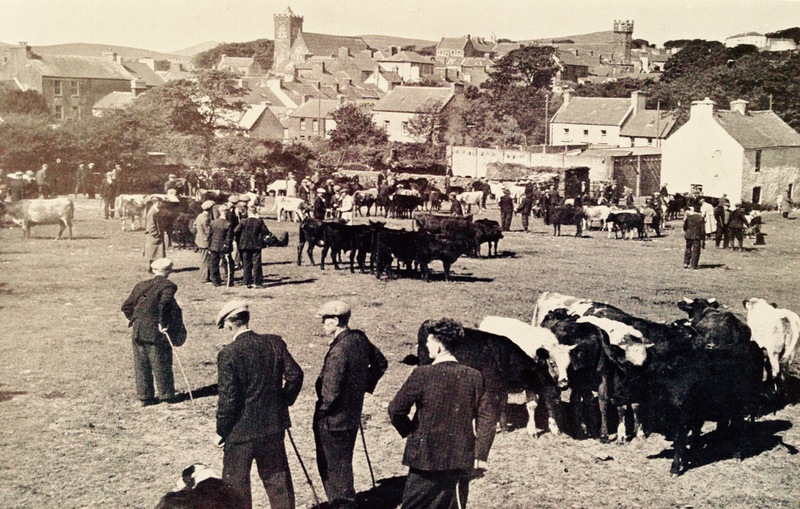 I like the idea of the Northsiders shouting across the water to the residents of the Sheep’s Head, two miles away! I wonder if they would be heard nowadays? 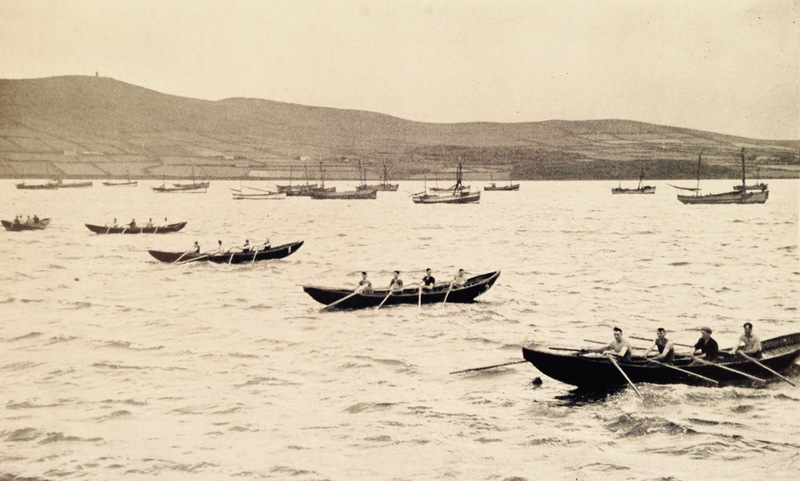 …There were competitions at Dunmanus for swimming, running, jumping and weight lifting, and you could be sure that the Northsiders were well represented in each of the events. 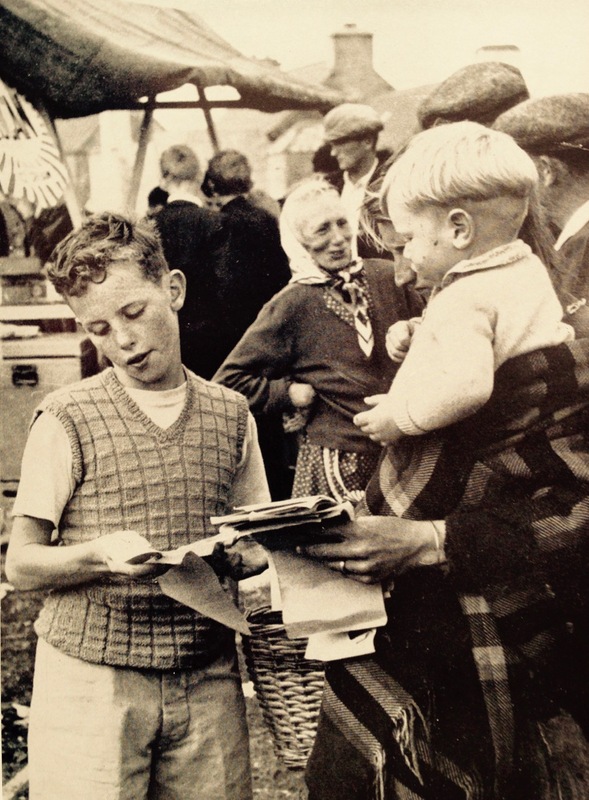 ‘Will the Hare’ (William McCarthy of Dunkelly Middle), was good at the long jump and the running races and would often win and bring great honour to the Northside. It was said that ‘Will the Hare’ got his name by catching a hare on the run! 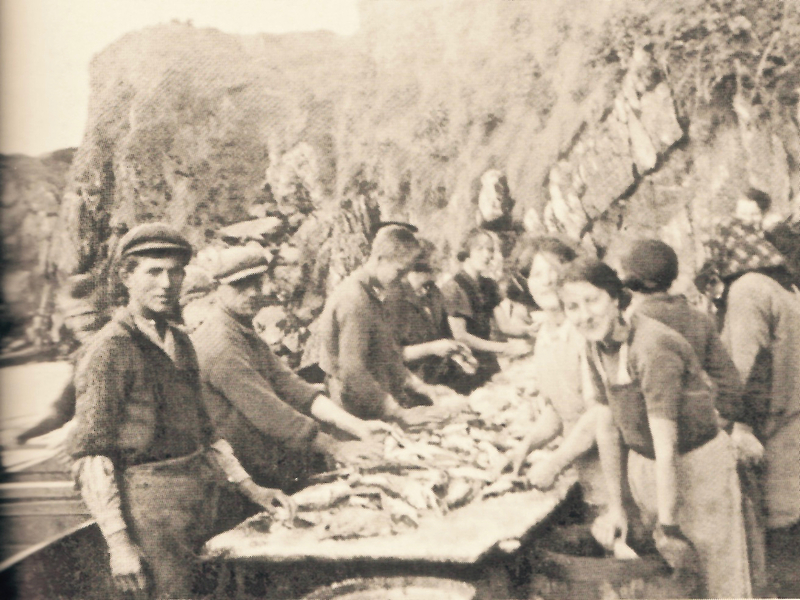 It was also said that when you blew the whistle to gather the men for seining, by the time you had finished, ‘Will the Hare’ would be at Canty’s Cove waiting! It’s been a wet, wet winter, but when the sun shines in February (which it does, honestly! ), we are out exploring. This particular day our companions were Jessie, Brandon, Amanda and Peter and our accompaniment was MUD, and lots of it. We had goals – Amanda was after some elusive holy wells and Robert wanted to find the pirate steps at Canty’s Cove for his talk on William Hull and the Leamcon Pirates’ Nest, part of the Ballydehob spring lecture series, ’Talks at the Vaults.’ Jessie is a professional tour guide, wanting to learn more about the Mizen. Finally, I wanted us to swing by Dunmanus Castle so I could check out a few construction details. You don’t actually need goals like this to go out exploring, but it helps. It gets you into places you wouldn’t normally go, down tiny boreens, into farmyards and across fields. You end up knocking on doors and meeting people who know all about the well, or the old stones, or the legends of the place, or who owns what field and whether he minds people tramping through it. On this occasion we met, for the first time, the near-legendary Pat McCarthy, one of the writers of Northside of the Mizen, and a huge authority on this area. We’ve promised ourselves a return visit with him as we weren’t able to stay long enough for a good talk. The best way to start a day like this is with excellent coffee, in Budds of Ballydehob, where we assembled with our map to plot our course. It was off then to Toormore and the Altar wedge tomb. On this occasion we weren’t actually after the wedge tomb (although I can never resist a photo of it) but the little holy well across the road. Our next stop was Dunmanus, to take a good walk around the castle with the camera, looking for details I had missed on previous visits. 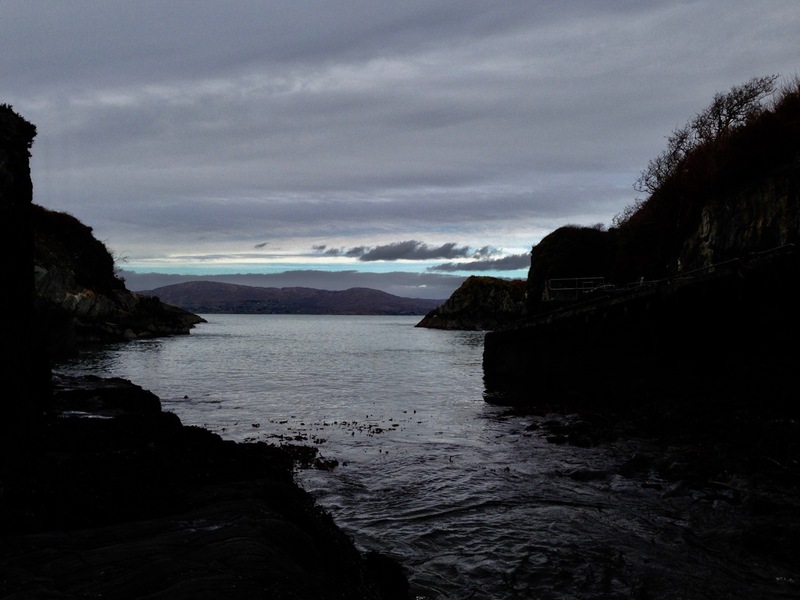 And then on to Canty’s Cove. You can read Robert’s post, Canty, for more about this place and its association with Canty the Pirate. Finding the steps wasn’t easy and it was a big thrill when we finally figured out where to look. How would you like to climb up these with a keg on your back? 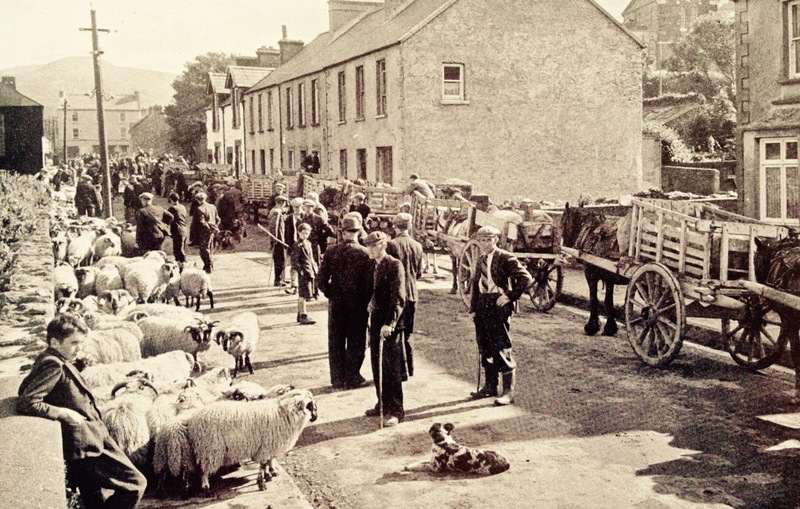 By then we were starving – this exploring is hungry work – so we repaired to O’Sullivan’s of Crookhaven for one of their famous crab sandwiches. Even at that early date the sunshine was so inviting that people were sitting outside with their sandwiches and their pints. From Crookhaven it’s a quick trip to Lissagriffin, where there’s a medieval church and a bullaun stone doing double duty as a holy well/wart well. The church has a panoramic view over the salt marshes behind Barley Cove Beach as well as interesting architectural features. Our next holy well was right by the side of the road a couple of miles further east – labelled so we couldn’t mistake it. The final one was harder to find and necessitated negotiations of some seriously muddy fields. Tobairín Brón (Little Well of Brone) was in the general vicinity of where we ended up, along with a small monastic site – all very brambly and hard to decipher. 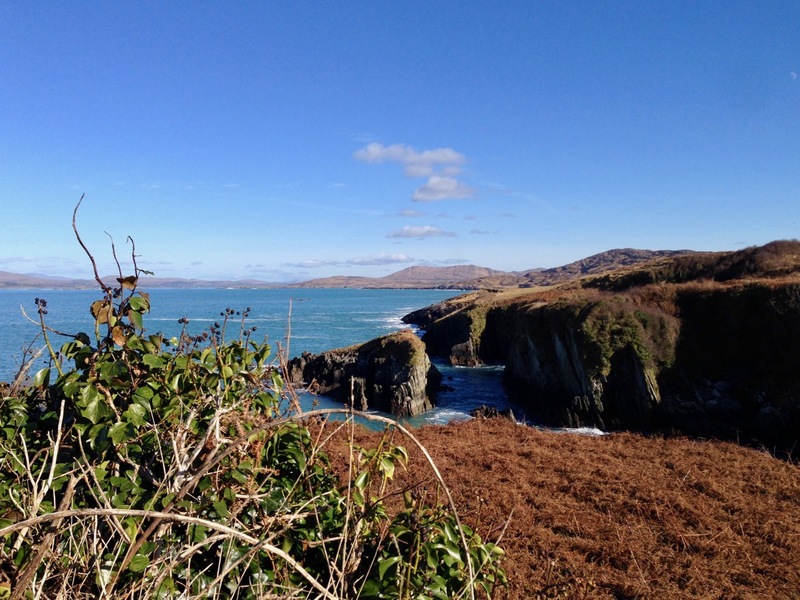 But what a place – a view clear out to the Fastnet Rock, with Knockaphuca looming behind us. Cnoc an Phúca means the Hill of the Mischievous Spirit – it’s been tamed, presumably, by the large cross erected on its peak. 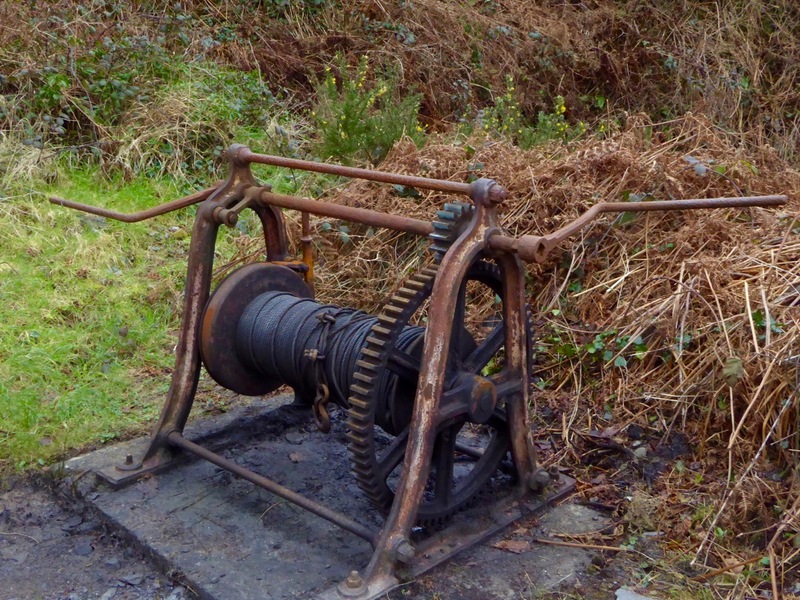 Read Amanda’s post for her take on the four wells we visited that day. By then the sun, so warming earlier in the day, had been overtaken by high cirrus clouds, and we were donning jackets and gloves and remembering that it was only February after all. As if to make up for its lack of warmth, it treated us to a magnificent solar halo (I’ve always called them sun dogs) as we made our way back to the cars. 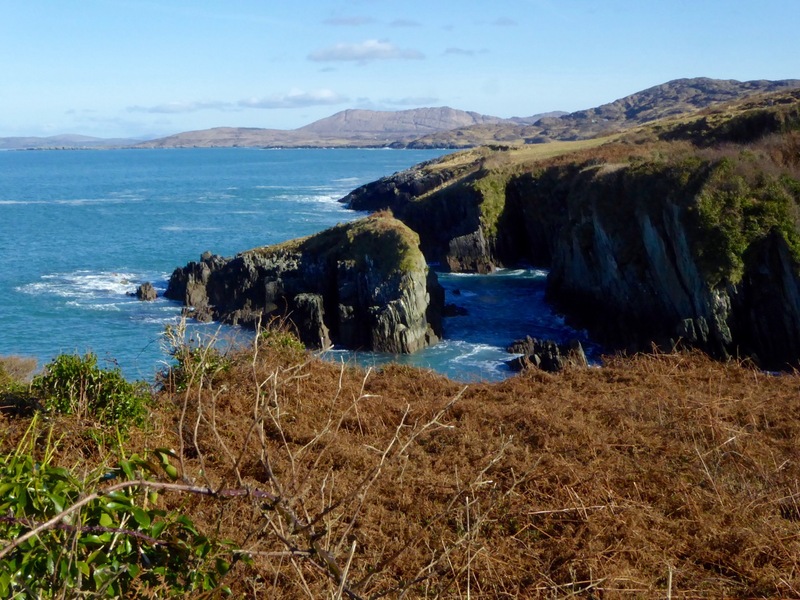 We were never much more than 30 kms (or about 40 minutes) from home but in that distance we managed to see heritage sites dating from the bronze age through the medieval period up to the recent past, surrounded all the time by the magnificent scenery of the Mizen. You can do this anywhere in Ireland. Using the Historic Environment Viewer of the National Monuments Service, define the area you want to explore, pick your fancy (ring forts? medieval churches? cross slabs? megalithic tombs? castles? rock art? ), and off you go. 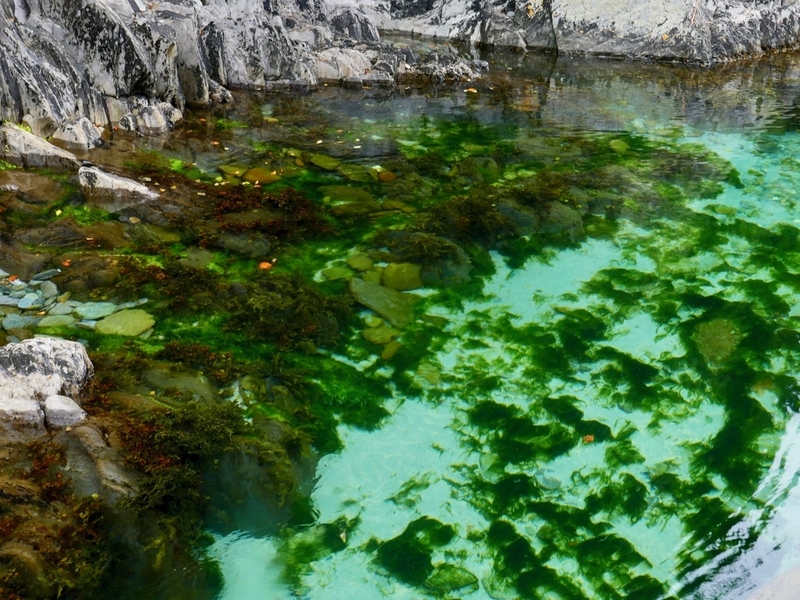 On the north side of the Mizen we found Canty’s Cove. 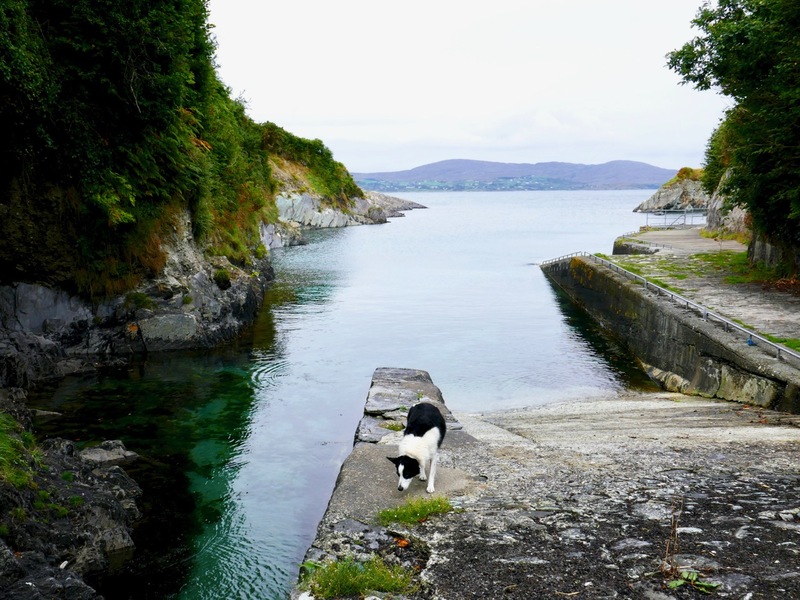 The little road which approaches the Cove from the west has been recently resurfaced, and there have been some major restoration works on the stone jetties and steps there. 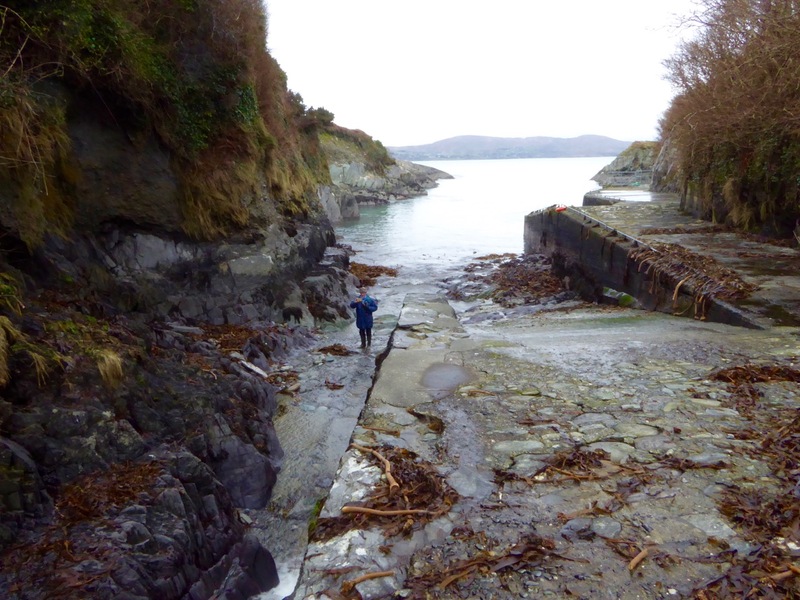 Don’t try to reach the Cove from the east side: a trackway is shown on the OS map (88), but it is virtually impassable – even on foot – at this time of the year, as the harsh winter storms have waterlogged the ground and submerged parts of it. Our reason for visiting the Cove? We were looking for pirates! 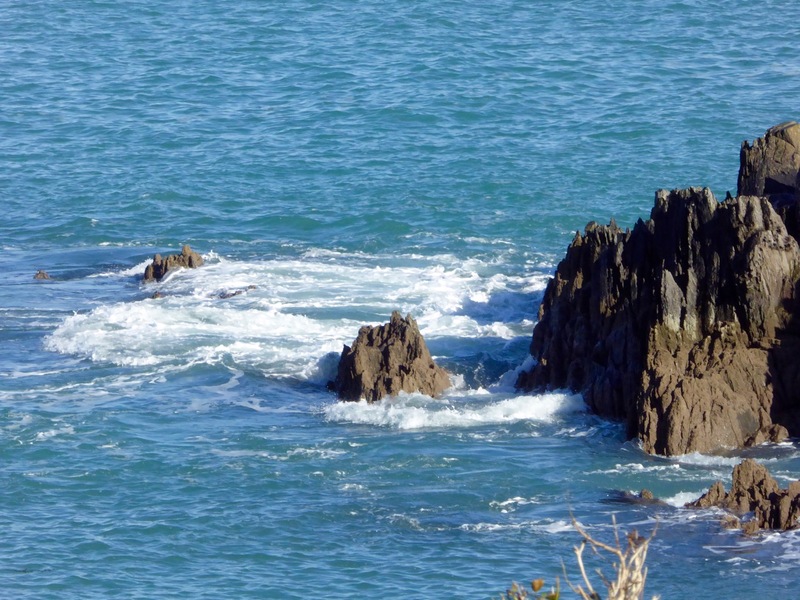 Or, at least, for traces of them… We had heard that there are ‘pirate steps’ in the vicinity of the Cove, and we had unearthed some legends of Canty himself: a notable pirate and all-round rogue. 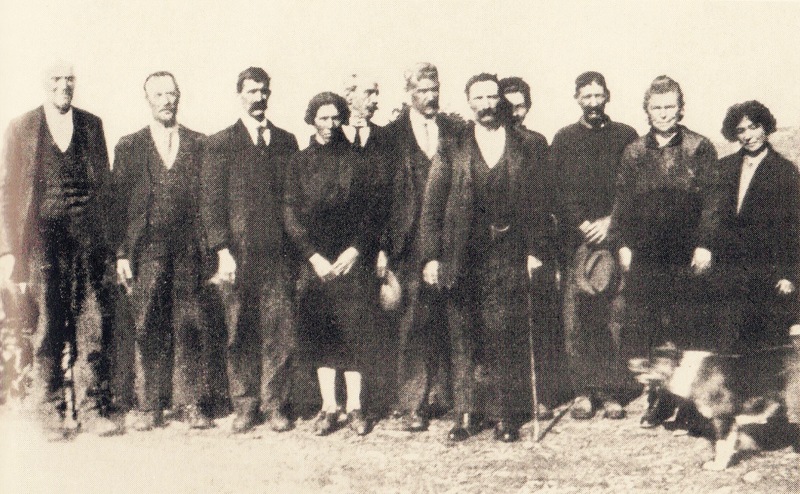 Many other similar stories connected to the Cove have been told or written down over the years. Today, the place still has an otherworldly feel to it: partly it’s to do with remoteness and the barren coastline in this wild place. ‘Canty’s House’ and ‘Canty’s Garden’ can be identified on the cliffs above the Cove: they are marked on old versions of the OS map. 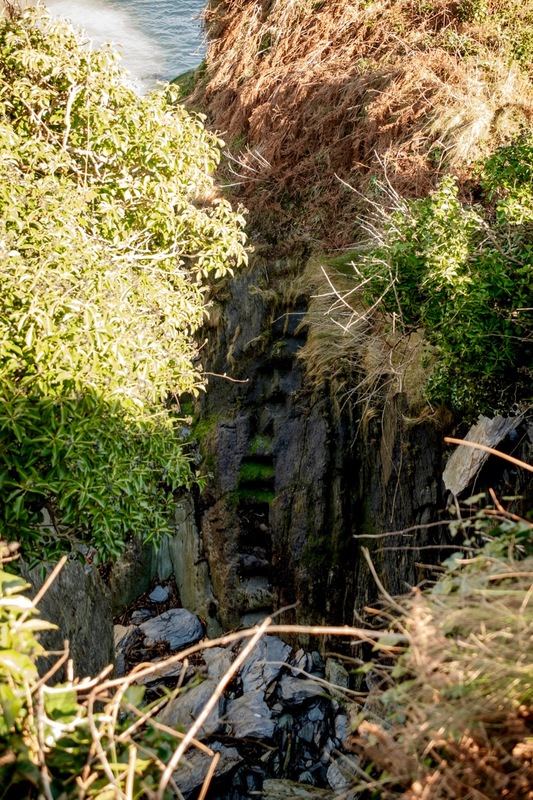 All that’s left now are a few stone walls and a steep drop into the sea. It’s not hard to picture Canty himself disposing of his victims over the edge, nor to hear their cries on the wind, wailing across the centuries. There are Cantys living in West Cork today. We shouldn’t brand them with the reputation of one who was possibly a forebear: after all, many centuries have passed since the time of Canty the Pirate – and we do live in a more civilised age, don’t we? 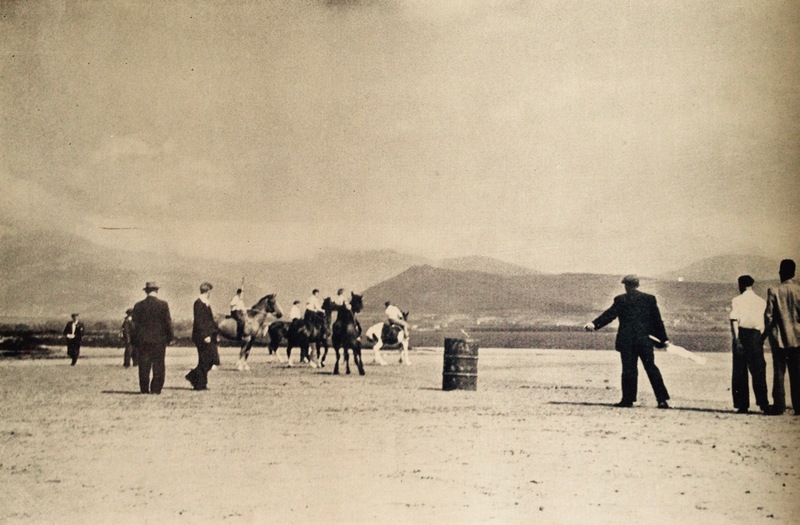 In fact, the Cantys – sometimes O’Cantys (O an Chaintigh) – had a prestigious past: in the age of the castles they were bards, like their O’Daly neighbours across the water on the Sheep’s Head (it’s only four miles away as the seagull flies). Interestingly, I have heard it suggested that Canty’s House is actually the remains of the ‘lost’ O’Mahony castle at Dunkelly: the site is certainly impregnable.